After a crowded jet-liner was deliberately crashed in the Alps earlier this year, many journalists talked about the need for psychological screening of pilots. It’s a good suggestion. But if we screen the pilots of planes, why don’t we screen the pilots of nations? Why aren’t aspiring politicians tested for dangerous traits like narcissism and psychopathy? If we had tests like that, Tony Blair, Bill Clinton , and Barack Obama would never have achieved high office. They are true children of the television age: all surface, no substance. At this time, there is literally no country in the West where a politician can achieve power without the support of Jewish interests. This article necessarily just scratches the surface (so I’m not even going to mention Sheldon Adelson, Haim Saban, the Republican Jewish Coalition, etc., or Hillary Clinton‘s long association with powerful Jews). Supporting Jewish interests is a great career move, whether it’s as a politician, making Hollywood movies, or writing for a neocon think tank. The war against Whites is massively incentivized. Writer Toni Morrison famously dubbed Bill Clinton “the first black president” – a title he fervently embraced. Abner Mikva, the Chicago Democratic Party stalwart and former Clinton White House counsel, offers a variation on that theme. “If Clinton was our first black president, then Barack Obama is our first Jewish president,” says Mikva, who was among the first to spot the potential of the skinny young law school graduate with the odd name. That photo, which dates from 1997 according to the Daily Mail, is now very embarrassing to Blair, especially since Janner was one of the first peers to be appointed to the House of Lords when Blair was elected. His grinning companion, Greville Janner, is officially accused of serious sexual offences against boys. Since leaving office, Blair has amassed a huge fortune by highly dubious means, turning the dross of his intellect into heaps of gold. His new career move is therefore not surprising. He will continue to serve his masters by becoming the front man for an organization co-founded by Moshe Kantor, President of the European Jewish Congress, dedicated to eradicating free speech on ethnic issues. Tony Blair is set to become chairman of an organisation that combats anti-Semitism, racism and xenophobia in Europe. The former prime minister is stepping down from his post as Middle East peace envoy [having achieved nothing]… and will join the European Council on Tolerance and Reconciliation (ECTR), which describes itself as a “non-partisan” organisation designed to promote “tolerance, reconciliation and education”. He will replace Aleksander Kwaśniewski, the former president of Poland. In his role, Blair said he could campaign for European states to implement proposals in the ECTR’s report Framework National Statute for the Promotion of Tolerance, which recommended judges should have greater powers to prosecute hate speech and to make Holocaust denial illegal. During his time as Middle East envoy, where he was working to end the Israel-Palestine conflict, Blair was perceived by Palestinians as being too sympathetic to the Israeli cause. As the Times points out, Blair’s decision to work at the ECTR could fuel suspicions that he was biased towards the Israeli side during his work as Quartet envoy. In Nineteen Eighty-Four (1949), George Orwell describes how the ruling ideology is openly “impudent” in its “deliberate reversal of the facts.” The Ministry of Truth is dedicated to lies and the Ministry of Love to torture, for example. Similarly, the European Council on Tolerance and Reconciliation is dedicated to intolerance and a fractured society. It calls itself “non-partisan” when it clearly reflects the interests of the organized Jewish community. So who better to serve as chairman of the ECTR than a liar and confidence trickster like Tony Blair? 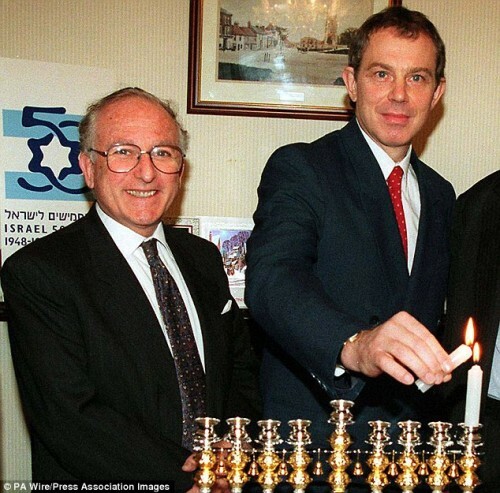 In 1997, he was standing with Greville Janner; in 2015, he’s standing with Moshe Kantor. All that has changed is the name of his master. The nature of his service remains the same: to work for Jewish interests. Those interests include implacable hostility to the White majority that still exists in both Britain and the United States. Jewish lobbies want that majority undermined and pushed from power by mass immigration from South America, Africa, Asia and the Middle East. This explains why Blair surreptitiously opened Britain’s borders during his time in power, causing huge harm to the White working-class who voted for Labour and creating huge problems for the future. The White working-class are now deserting Labour, who rely more and more on the votes of ethnic minorities. Of course, the Conservatives are no better. Like the Republicans in the United States, the Conservatives are desperate to discard their image as a White party by wooing saintly ethnics away from the left. The Republicans dream of a plausible non-White candidate for the presidency. The Conservatives aren’t dreaming: they’re already grooming a non-White to be prime minister. 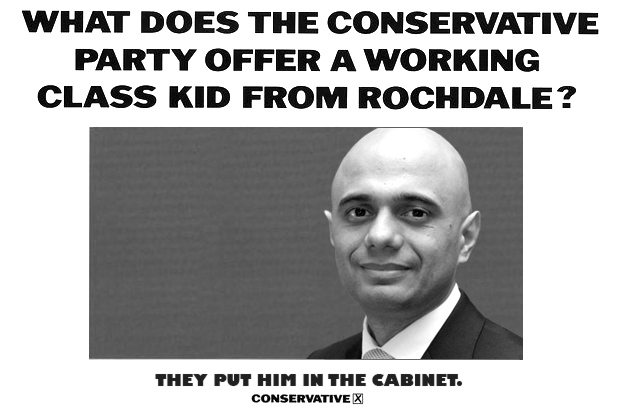 His name is Sajid Javid and you’ll be relieved to hear that he doesn’t come from the slippery and devious world of lawyers. No, he’s a former banker instead. Isn’t that reassuring? He’s also a Pakistani Muslim but you can be sure that he will not emulate Sayeeda Warsi, the Tory chairwoman who resigned in protest at her party’s bias towards Israel. In December last year, a journalist at the neo-conservative Spectator swooned with pleasure when Javid delivered “one of the finest speeches from a government minister I have ever read.” In fact, it was fawning speech by someone attempting to ingratiate himself with the people who matter. As I’m sure you’re all aware, there’s an increasingly vocal campaign for a full-scale cultural boycott of Israel. It’s a campaign I have no time for … It was wrong when Gurpreet Kaur Bhatti’s Behzti came under siege from members of the Sikh community. It was wrong when Christian groups tried to drive Jerry Springer The Musical off the stage. And it’s wrong when Jewish artists are targeted simply because of their connection to Israel. A century ago William Howard Taft called anti-Semitism a “Noxious weed”. A century later, I don’t want to see that weed taking root in any aspect of British life. That’s why I will always be proud to stand up and resist calls for boycotts of Israel. I know that such calls are nothing more than a smokescreen for the oldest hatred. That’s why I am proud to see the government taking real action against anti-Semites who want to gain a foothold in Britain’s universities. We’re denying a platform to extremists who would abuse our freedoms in order to sow the seeds of division. And that’s why I’m proud of the work we’re doing with the Holocaust Educational Trust. We’re paying for two teenagers from every British school to visit Auschwitz, letting them see for themselves the horrors of the Shoah. I had the privilege of joining a group of children from my constituency when they visited two years ago. I’ve read a great deal about the atrocities of the Nazi regime. And I was extremely moved by the permanent Holocaust exhibition at the Imperial War Museum. But nothing can prepare you for the experience of actually being there. The Prime Minister found that for himself when he visited this week. I’m sure everyone who goes to Auschwitz is touched by what they see in different ways. For me, I will never forget the sight of a case filled with thousands upon thousands of shoes taken from those who were murdered. Mixed in among them there were countless tiny pairs that had clearly been stolen from the feet of children. I’m proud to be the child of immigrants. It’s who I am. It’s what I am. The same was true of Yehudi Menuhin. He was born an American and died a British citizen. But for his whole life he was, of course, Jewish through and through. I know that his name, Yehudi, is the Hebrew word for “Jew”. But what I didn’t know until recently was the story of how he came to be called that. You see, not long before Menuhin was born his parents were out house-hunting together. I think it might have been in New York. They thought they’d found the perfect place. But as they were leaving, the landlady, unaware of their background, cheerily told them that: “You’ll be glad to know I don’t take Jews!” His parents were rightly appalled, though sadly not surprised. But they were proud people. They didn’t want to hide in the shadows. To deny who they were. To simply ignore the bigotry of others. So there and then, they decided that their unborn child would be given a name that declared his race and religion to the world. If you ever need to show someone the meaning of the word “sycophancy,” I would recommend you show them that speech. It’s an extended exercise in grovelling. But while the speech might have appealed to Jews, it will definitely not have appealed to the Muslims currently enriching Britain. Pakistanis, Bangladeshis and Somalis might be of low average IQ, but they can recognize a traitor when they see one. 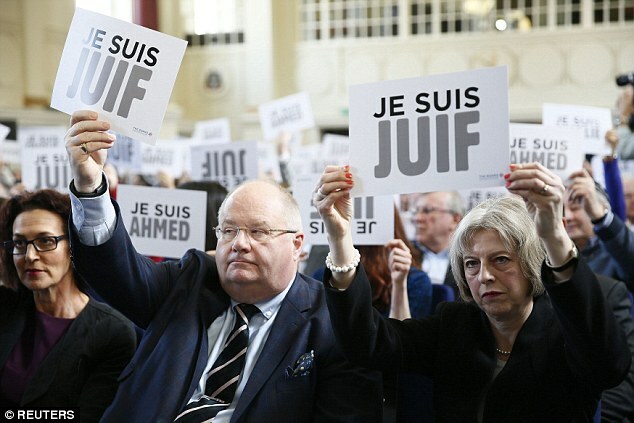 Violent and corrupt Muslims have flooded into Europe because Jews like Moshe Kantor and Greville Janner wanted them here to undermine the White Christian majority. The chief victims of the invasion have been Whites, especially working class Whites, who opposed mass immigration, not Jews who supported it. But people who point this out will be demonized as “anti-Semites.” If Kantor and his puppet Tony Blair get their way, those people will also go to jail. Like Obama and Clinton, Blair was utterly unfit for power. But in a political system where one cannot achieve power without genuflecting to Jewish interests, that’s precisely why he got it.